8:00 - 8:30. Pick you up at the hotels in Old Quarters area, then leave by coach to Hoa Lu (2.5 hrs). 11.00 Visit the historic capital of Vietnam and the famous ancient temples of Le and the Dinh Dynasties. Then our bus will transfer you from Hoa Lu to Tam Coc for lunch around at 12:30PM. PM : Boat trip to visit Tam Coc to see the beauty of the karst formations as you pass along their base and row into one of the many caves carved through the limestone. Then, cycle for an hour on quiet roads through villages, rice fields, rivers and rocky outcrops in Tam Coc - Bich Dong (around 5 km). 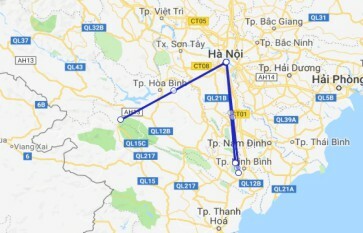 Dive back to Hanoi and drop off at your hotel around at 18:00PM. Ninh Binh tour was really good : we enjoyed the visit of King temple, Mai Chau hike so exceptional! Lunch was really good and there were so many dishes that it was like a king lunch. Boat on Tam Coc was really beautiful, we had an amazing "driver", really kind. Finally, we got bicycling under rain in paddy fields (a little bit too short). Our driver was very nice and our guide (Hien) was kind and explained us a lot of things about Vietnamese culture. Myself, my husband and two-year-old son booked a private three-day two night tour through maichautours.net for the 15-17th July. We were collected early in the morning from Hanoi and taken to Mai Chau for a biking tour around the village and a trip to a remote cave (1200 steps up into the mountains – beware this is a tough one!). The first night was spent with a family in a stilt house in the village (homestay 19). The food here was amazing and the family were very welcoming. The scenery was gorgeous. The second day we departed to Ninh Binh early in the morning and visited Hoang Long river and Van Long Nature Reserve. We had the local speciality of various goat meats at a local restaurant and then visited Hoa Lu (King Dinh and King Le temples). We stayed at a local hotel which to be honest wasn’t great (and we spent the whole trip staying in homestays and hostels so we weren’t expecting much). On our final day we look a foot-rowed boat around the Tam Coc region which was fantastic and were then driven to HaiPhong to catch the boat to Cat Ba (which we arranged ourselves). Our guide made sure we had our tickets and provided us details for anything else we might need on our trip. I’d recommend all the actives we did (rowers of boats will ask for tips), it was amazing. The cost included all entrance fees, food and water as well as a private, decent AC car with driver and guide. While this was expensive, it was worth it. Our guide (and driver) were fantastic. Cuong was polite, fun and interesting and his English was amazing. He was also really clued up on international politics and we had several great discussions about life in Vietnam and abroad. I would recommend him to anyone and we hope to stay in touch with him!